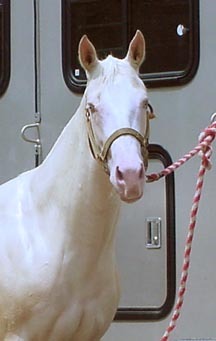 Beautiful cremello overo filly. Well started under saddle, fast learner, is pivoting, sidepassing, backing, transitioning up and down on loose rein, etc. 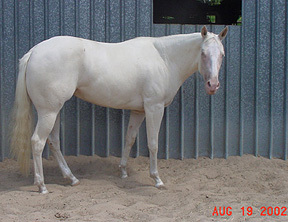 With a little work she should make an exceptional Western Pleasure, Trail, and Horsemanship prospect. 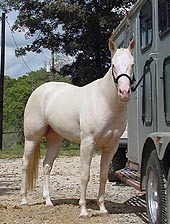 Being a cremello means that she is homozigous for the creme gene which is responsible for producing Buckskins and Palominos 100% She will never throw a sorrel or a bay . 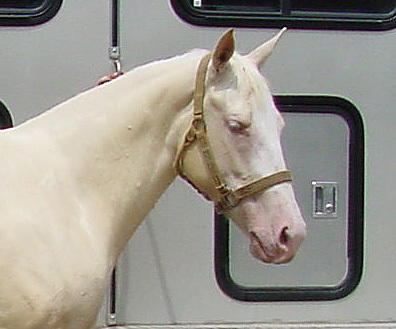 Her sire is a 16h APHA palomino overo. 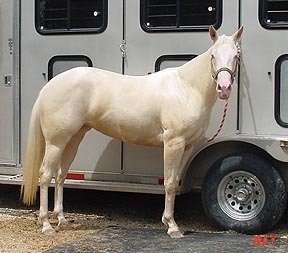 Her dam is a 14.2h APHA / IBHA buckskin solid that excells in Western Pleasure, Trail and Western Horsemanship. 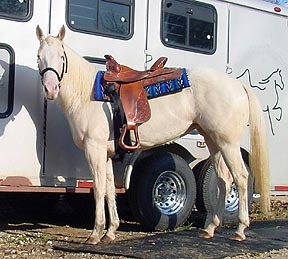 She can be ridden bridless, and is an exceptionally smooth mover, as is Tina. DO NOT LET THIS RARE OPPORTUNITY PASS YOU BY! "Hobo Dun Mis D Train"
....I started her under saddle a year ago (as a two year old) but she probably only actually has about 60 days actual riding. (that's what too many horses does) I am an amature but break and train all my own horses using John Lyons techniques. The amount of training she will need before she could be considered finished will depend on what you are wanting her trained for and how competent the trainer is. I have seen some horses ready to go into the show pen after just 90 days riding. 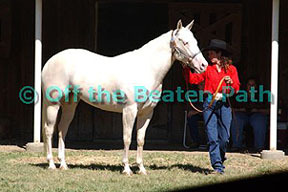 I had one before that I showed in trail after only 60 days under saddle and he took a first and third with 8 in the class. Tina is a willing learner and already knows a lot of things. I do have a video of her walking and troting going around obstacles and over a bridge and some logs just to show you how well she maneuvers and pays attention. Tina is currently 14.2 Her sire is 16h, her dam is 14.2 I don't know how tall Tina will be but if I had to guess...I would think she should be somewhere in-between sire's and dam's size. So far she seems to be quiet under saddle. She hasn't been to a show but I have hauled her several times to a friend's arena and ridden around other horses. She didn't seem to mind the traffic. She has been properly trained to load in a trailer since she was a weanling. She will hop right in and back right out with no problems. 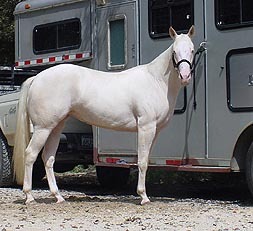 She has been in an open stock trailer and in a narrow three horse slant. I have never tried to use clippers on her...I have clipped her bridle path with scissors. She is very good with a bath even when squirting directly in her face, between her ears, etc. (as long as you don't get water directly in her ears) I am the only one who has trimmed her feet and she usually stands untied in the middle of her pen when I am doing them...she will also stand tied. I would consider her to be green in her training but she is loping. She usually picks up the correct lead. She is going on very light cues, I don't use spurs, and I ask her to do things as soft as I can. She is very responsive and willing to please. She gives to the bit very softly and puts her head down with a very light squeeze of both calves. 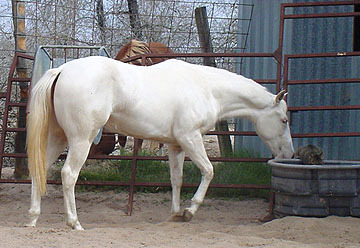 A light bump with both calves gets her walking...a touch with both heels gets her trotting...and a touch with one heel or the other a little further back gets her to loping. She sometimes still trots before picking up the lope but she is learning to pick it up from the walk now. 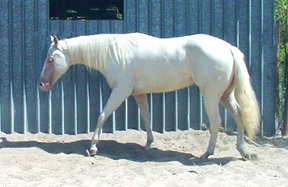 She will also pivot on hind or forequarters with a very light touch of your foot, and side-pass with a light touch of one calf or the other. 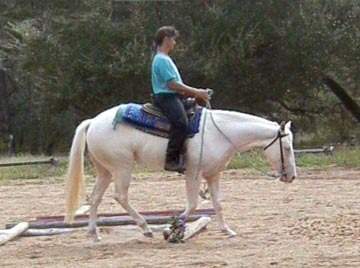 I try to train all my horses, to go on very light cues. As far as her personality I would have to say she is somewhere in-between in-your-pocket and timid. She loves to be scratched, in particular on her belly, and will follow you around till you do so...but sometimes she can be timid. She has been in a stall and will stay in one with no problems, and also knows what hot wire is...she is also quick to know when it is not on...lol and will escape. She has never been sick a day in her life, not even a runny nose. She is on daily Strongid C wormer. I feel that with the proper training, as easily as she is learning, she should be great at western pleasure, western horsemanship, and trail. She is definitely a smooth and pretty mover. I could email a digital video of her turning and walking over a set of logs. You can get an idea of how easily she maneuvers and transitions...on very light cues. I could get a hard copy video to you also. If you are seriously interested in her, let me know where to send it to. Thank you and congratulations to Dania. It's Dania! 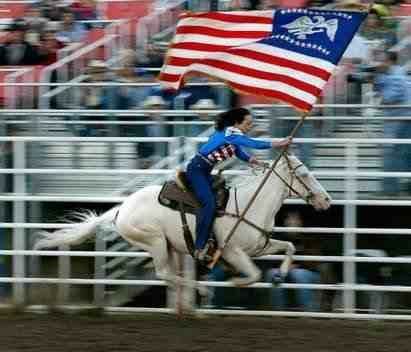 Tina and I are doing great, we will be running barrels and poles beginning October "2004" in the ACBRA and American West. Some people thought that "Tiny" Tina since she is small still about 14-1 maybe 14-2 was too small, I told them size does not matter! 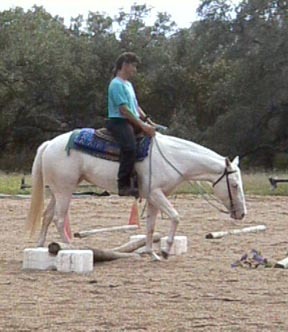 She is making an awesome pole horse and I am currently training her as a heel horse. Since I am not a heeler (header) Tina gets a lot of slow time. 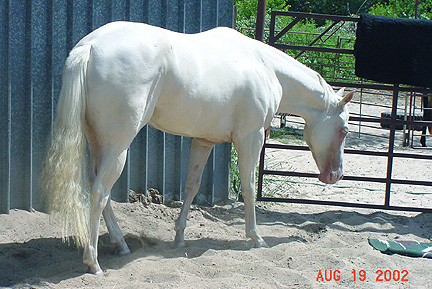 It did take her some time to extend (wanted to be a Western Pleasure horse) still not at her full ability. she is the main horse I ride and did not want to ruin or hurt her. I LOVE TINA! Someday I will send you a video.